Israeli Air Force (IAF) aircraft struck in Gaza on Tuesday night and eliminated a terrorist who was involved in rocket attacks on Israel, the IDF Spokesperson’s Unit said in a statement. The statement identified the terrorist as Ahmed Zaaneen from the Popular Front for the Liberation of Palestine (PFLP), who in the past was a member of the Islamic Jihad terror group. He was targeted in a joint IDF-Israel Security Agency (Shin Bet) operation, said the statement. Zaaneen had been involved in rocket attacks on southern Israel in recent days and was planning further attacks. Amongst his most recent attack was the launching of rockets during the funeral of former Prime Minister Ariel Sharon on January 15, the IDF said. “The IDF sees as very serious any firing at Israeli territory and will continue to act strongly against any attempt to carry out terrorist activities,” the statement continued. “The IDF is prepared to defend the citizens of Israel,” it added. Eyewitnesses to the attack and local medical sources told the AFP news agency that a second person was killed in the Israeli airstrike. The second man was identified as Mohammed al Zaaneen, 23. The two died when the car they were travelling in was hit near Beit Hanoun in northern Gaza, the sources told AFP. Rocket attacks from Gaza have been on the increase in recent days. 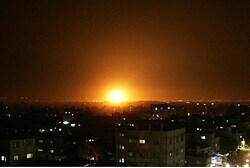 On Monday night, three rockets fired by Gaza-based terrorists exploded in the Eshkol Regional Council. On Saturday night, IAF aircraft targeted several terrorist sites in Gaza after a rocket exploded in an open area between two communities in the Sha’ar Hanegev Regional Council. On Tuesday morning, an explosive device went off close to the security fence separating Israel and Gaza, near Kisufim. No one was hurt. Defense Minister Moshe Ya’alon warned Gaza terrorists on Sunday that the IDF would hit hard and fast against terror targets each time Israel was attacked. “The IDF on Sunday morning targeted a terror cell that was responsible for firing rockets at Israel last week, when rockets were fired at Ashkelon,” Ya’alon said.